Ipswich Town missed the chance to go top of the Championship but extended their unbeaten run to eight games with a goalless draw at in-form Bolton. 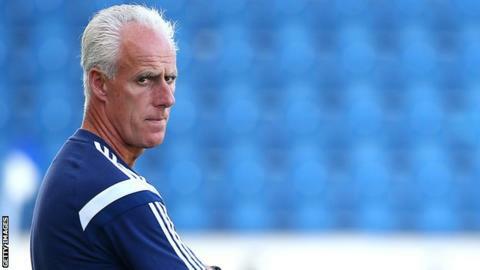 Derby's loss at Middlesbrough earlier in the day meant a win would have sent Mick McCarthy's side to the summit. Midfielder Jay Tabb had their two best opportunities after half-time, but a close-range shot and a header were both kept out by goalkeeper Andy Lonergan. Eidur Gudjohnsen played the final 30 minutes as a substitute for Bolton. The 36-year-old former Chelsea and Barcelona forward made his first appearance for the club in more than 14 years after returning to Wanderers on a free transfer last week and was booked with a minute remaining. Eidur Gudjohnsen scored 27 goals in 77 games during his first spell with Bolton Wanderers between 1998 and 2000. The Iceland striker's last outing before leaving to join Chelsea was against Ipswich in a second-tier play-off semi-final, a game in which he scored. Bolton, who have now gone six matches without defeat, dropped points at home for the first time since Neil Lennon took charge in October. Neither side could break the deadlock in an even first half, although both had chances to do so. Lonergan tipped Daryl Murphy's lofted effort over the crossbar, and the Ipswich striker then curled a shot wide after being found by a glorious long-range pass from highly-rated full-back Tyrone Mings. The hosts, who have taken 18 points from their 10 games under ex-Celtic boss Lennon, went close themselves when Max Clayton's shot was blocked by Christophe Berra and defender Tim Ream fired over. Ipswich took control after the interval, but they could not find a winner. After Lonergan's two saves from Tabb, Berra sent David McGoldrick clear but the striker's shot from a tight angle went wide. The Tractor Boys dropped to fourth in the table, with Bournemouth the division's new leaders, while Bolton moved five points clear of the relegation zone. Bolton manager Neil Lennon: " "If you can't win the game then don't lose it. "I thought we had two good chances in the first half and Ipswich came on strong in the second. That's three clean sheets in a row but we just need a recipe for going forward. "Eidur (Gudjohnsen) came in and gave us an injection of quality and life because we did lose our way. He will get better. He even got booked so he showed he has got lots of fight left in him which is always pleasing to see." Ipswich manager Mick McCarthy: "In the second half we were the dominant team but in the first I thought Bolton were the better side. "They were a bit profligate when they had chance to create something and didn't. But our goalie didn't have save to make. In the second, there only looked likely to be one winner but in this league I was always conscious they didn't nick one and we got nothing from it. "Bolton are back at it now." Match ends, Bolton Wanderers 0, Ipswich Town 0. Second Half ends, Bolton Wanderers 0, Ipswich Town 0. Noel Hunt (Ipswich Town) wins a free kick in the defensive half. Corner, Bolton Wanderers. Conceded by Christophe Berra. Attempt blocked. Lee Chung-Yong (Bolton Wanderers) left footed shot from the right side of the box is blocked. Assisted by Josh Vela. Noel Hunt (Ipswich Town) is shown the yellow card for a bad foul. Tim Ream (Bolton Wanderers) wins a free kick in the attacking half. Eidur Gudjohnsen (Bolton Wanderers) is shown the yellow card for a bad foul. Foul by Eidur Gudjohnsen (Bolton Wanderers). Substitution, Ipswich Town. Darren Ambrose replaces Jay Tabb. Tim Ream (Bolton Wanderers) is shown the yellow card. Foul by Tim Ream (Bolton Wanderers). Corner, Ipswich Town. Conceded by Matt Mills. Attempt blocked. David McGoldrick (Ipswich Town) right footed shot from outside the box is blocked. Assisted by Daryl Murphy. Attempt missed. David McGoldrick (Ipswich Town) left footed shot from the centre of the box misses to the left. Assisted by Noel Hunt. Delay in match Lee Chung-Yong (Bolton Wanderers) because of an injury. Substitution, Ipswich Town. Noel Hunt replaces Paul Anderson. Tyrone Mings (Ipswich Town) is shown the yellow card. Paul Anderson (Ipswich Town) wins a free kick on the right wing. Corner, Bolton Wanderers. Conceded by Tyrone Mings. Substitution, Ipswich Town. Kevin Bru replaces Teddy Bishop. Substitution, Bolton Wanderers. Josh Vela replaces David Wheater. Jay Tabb (Ipswich Town) wins a free kick in the defensive half. Attempt saved. David McGoldrick (Ipswich Town) right footed shot from the right side of the box is saved in the centre of the goal. Assisted by Daryl Murphy. Attempt missed. David McGoldrick (Ipswich Town) right footed shot from outside the box misses to the left. Assisted by Paul Anderson. Offside, Ipswich Town. Cole Skuse tries a through ball, but David McGoldrick is caught offside. Attempt missed. David McGoldrick (Ipswich Town) left footed shot from the left side of the box is close, but misses to the right. Assisted by Christophe Berra. Attempt missed. David Wheater (Bolton Wanderers) header from the centre of the box is high and wide to the right. Assisted by Tim Ream following a set piece situation.